Despite various attempts to slow China’s massive real estate bubble, nothing has thwarted it to date. Desperate authorities are taking another swing this time around at what some property developers have called “the biggest bubble of all time”. As of Saturday, Property owners in Xi’an, Chongqing, Nanchang, Nanning, Changsha, Guiyang, Shijiazhuang and Wuhan must now wait two years before they can resell flats, regardless of whether they are new builds or older homes. 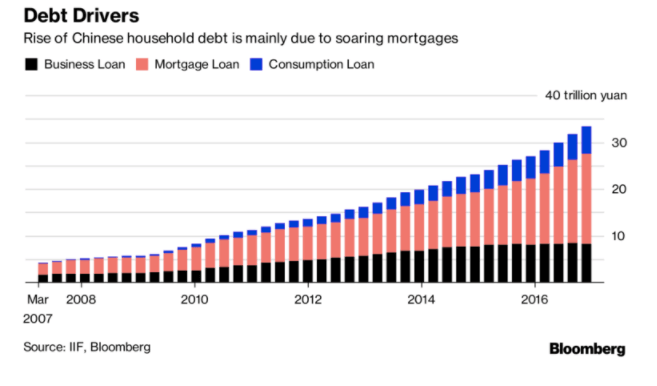 It remains to be seen if this will have any impact on China, which has undergone the single largest credit binge in economic history. Massive amounts of leverage and build up of household debt from the property sector have become a huge concern. Naturally, with an abundance of excess credit, and rising home values in China, that money has overflown into other parts of the world, in particular Vancouver. According to David Green-Morgan, global capital markets head of research at JLL the surge in outflows only took off in the past couple years. In 2007 China’s commercial property outflow was less than $1 billion. Now it exceeds $20 billion annually. At the Shenzhen Real Estate Expo, marketing brochures included computer-generated images of faraway places with clear blue skies, perfectly manicured lawns, white sand beaches and alluring tourist attractions. Not to mention Vancouver condo developments. However, with the Chinese government recently clamping down on capital outflows luxury markets are starting to bite. Including Vancouver, which has seen home sales above $1M plummet by 18% this year. Not to mention Detached dollar volumes are down 37% year to date. With every swing the Chinese Government takes at their property bubble a ripple effect trickles it’s way across the globe.